Chicago, IL (August 21, 2017) – Chicago’s Whiner Beer Co. will expand its distribution into key Ohio cities in early September. The initial launch markets will include Cincinnati, Cleveland and Columbus, and will feature Whiner’s core brands in cans and on draft, along with limited releases. 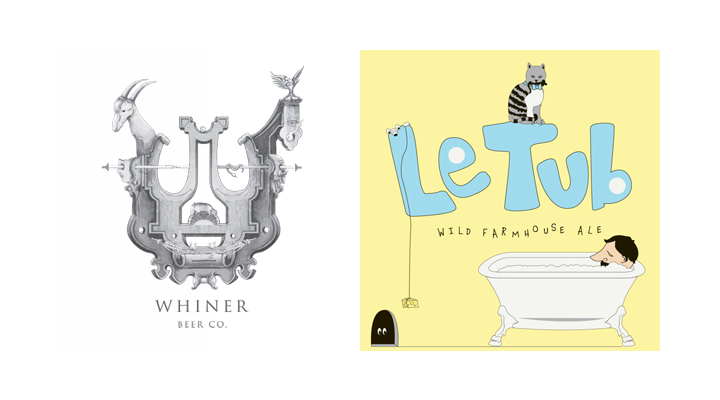 Whiner’s core brands are Le Tub, a blended barrel-aged wild saison, Miaou, a blended barrel-aged dry-hopped Belgian wheat, and Rubrique-a-Brac, a dry-hopped wild Biere de Garde. Limited releases will include Woolly, a barrel-aged Belgian sour brown with cherries, Soupe Du Jour, a barrel aged sour saison, Fur Coat, a Belgian dark, Bubble Tub a sour saison with watermelon and Francine, a 100% barrel fermented wild ale with brett clauseneii. These beers will be available in select bars and restaurants in each city. Whiner will release more information regarding special launch events in the coming weeks. Building off strong success in Chicago, Whiner’s move into Ohio aims to capitalize on each city’s similar market structure and strong craft beer base. It has chosen to work with Cavalier Distributing, a leading craft and import beer distributor in the country. Along with Whiner’s strong distributor relationship, Taylor also recognizes a place in the Ohio market for a brewery that thinks outside of the box. Whiner’s brewery is as unique as its beers. The company operates out of “The Plant”, a fully-sustainable green building designed to convert 100 percent of the brewery’s organic waste either into energy or recycle it for the creation of another product within the building. Le Tub – A Blended Barrel-Aged Wild Saison. Rubrique a Brac – A Dry-Hopped Wild Biere de Garde. Interested in selling Whiner Beer at your restaurant, bar or retail store? Interested in becoming a distribution partner for Whiner Beer Co.? Please contact Lanny Hoff with interest. For interview opportunities with Whiner Beer Co. co-founder Brian Taylor, or for more information about Whiner Beer, its state-of-the-art brewery and special roll-out events, please contact Lanny Hoff at +1 (612) 245-5433 or by email at lanny.hoff@artisanalimports.com. About Whiner Beer Co.: Whiner Beer Co. is a Chicago-based brewery which focuses on barrel-aged beers and the Belgian tradition of spontaneous and alternative yeast fermentations. The brewery is housed in The Plant, a net-zero energy business incubator in Chicago’s historic Back of the Yards neighborhood. Whiner is run by co-founder Brian Taylor and partner Rita Nery, veterans of the beer and beverage industry. Learn more at www.whinerbeer.com.